Occupying the third position in Chinese Astrology, the Tiger symbolizes power and authority, competitiveness and unpredictability. Tigers can be good leaders. They will also accept any challenge to protect loved ones and their honor. Don’t let their calm appearance fool you as Tigers will pounce when they feel it’s necessary. Tomorrow evening, we shall usher in the year of the Metal Tiger with traditional Chinese practices and festivities for an auspicious new year. On Sunday, February 14, 2010 marks the first day of the Tiger year. 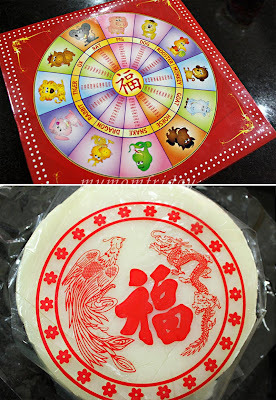 Here in the Philippines, when one receives tikoy from Chinese friends, we know that new year is just around the corner. Traditionally, you don't buy your own tikoy. But sometimes, you just can't wait for someone to hand you that ubiquitous red box, and you just have to buy one yourself and indulge in that gooey, chewy, sweet delicacy that abound during this time of the year. You can say tikoy is a seasonal treat but it takes many forms and you can readily buy a variety of tikoy products in your local Chinese deli or bakery. Tikoy (loose translation: sweet cake) is a sweet confection made from glutinous rice flour, sugar and water, pounded and mixed until smooth. Then, it's steamed in a mold, cooled, wrapped in plastic, and placed in a bright red box with the Chinese symbol for luck. Why tikoy for new year? Well, here's a simple rationale: Tikoy is made to be sweet and sticky. The giver wishes for the recepient to have a "sweet and harmonious family life" and for "good fortune to stick" to them in the coming new year. For the Filipino interpretation, "isang matamis na pag-sasama at kapitan ng swerte sa bagong taon". As with most people, the way we cook our sliced tikoy is to dip in egg first, then fry. When I saw my son's pre-school teachers prepare the tikoy during their Chinese New Year school celebration some years back, I thought it was brilliant! It makes cooking tikoy easier, without the mess, and eating it is so much more pleasurable. I am a self-confessed tikoy addict. Since then, I cook them like a spring roll. 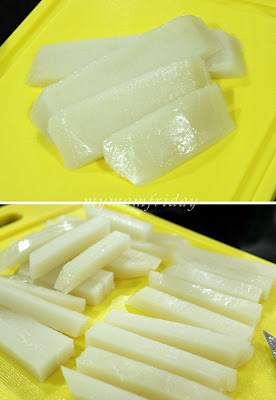 Simply slice the tikoy and cut like large french fries. Set aside. Peel small sheets of spring roll wrapper, one for each tikoy stick. In a small sauce bowl, mix 1 teaspoon cornstarch diluted in 2 teaspoons water. This will serve as your paste or binder. Wrap each tikoy stick carefully. Hold the end while you dip you finger in the cornstarch water and swipe to seal the tip of the wrapper. Set aside all the wrapped tikoy. Before oil reaches smoking point, fry your lumpiang tikoy. Don't worry how long you should cook this, the tikoy was already cooked/steamed from wherever factory it came from before it was even packed. When done, drain and rest the rolls on paper towels to absorb excess oils. This was the first time the kids have tried eating this sweet, sticky confection in a crunchy form. They loved it! Even with a front tooth missing, it did not stop my boy from biting and munching several sticks until he got so full from this snack. Nowadays, the tikoy not only appears in white and brown (brown sugar is used), but also comes in different colors and flavors like ube (purple yam), pandan (in green), strawberry (in pink)! A unique innovation from the plain tikoy was this new discovery at the Savemore grocery's bakery section today. Introducing HOPTIK -- hopia at tikoy. Give it to the Pinoys when naming special food combinations. Hoptik is your typical flakey hopia (Fujian pastry with monggo/mung bean paste filling) on the outside AND stuffed with soft, chewy tikoy center. Imagine that! 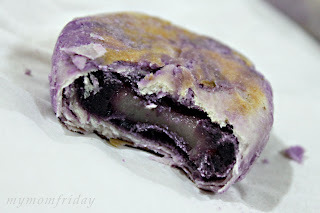 At P32 per pack of 4, I bought the Ube flavor which had a middle layer of ube paste instead of the regular monggo filling. I ate two in one sitting and it was delightful and filling! With the many incarnations of this humble tikoy, I hope you get to try the Lumpiang Tikoy 'coz I'm sure, you will enjoy its crunch and chewy goodness as much as we did. The kids just can't get enough of it. Gone are the days when you fry gooey tikoy squares that become too oily and flat when served, and will stick to your plate and fork while you eat. Happy eating. 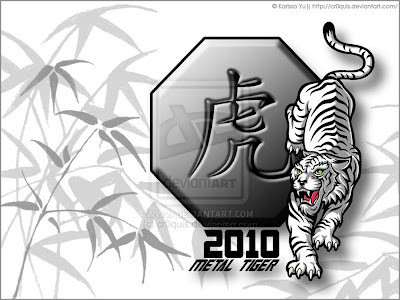 From my family to yours, we wish you peace, harmony, good health and prosperity in the Year of the metal Tiger! And here's my CHEESY TIKOY -- try it!